Pan Card Correction is no more complex and difficult. As I had stated in my earlier post “how to apply PAN card online” that the process of online application is easy and simple and I assure that same is the case with Pan Card Correction process. Yes it is simple and easy as it is all online. There may be thousand reasons to change the PAN card. Change of name in PAN card etc. One should have proper documents for the change, he wants in his PAN card. Suppose if you want to change your name in PAN card, then you should have proper document with new name like Driving licence, Voter ID, Pass Port etc. You can make changes in the PAN card either by NSDL or by UTI. Since the process of NSDL is much easier I stated the steps accordingly. You will also find here answer of the following questions . 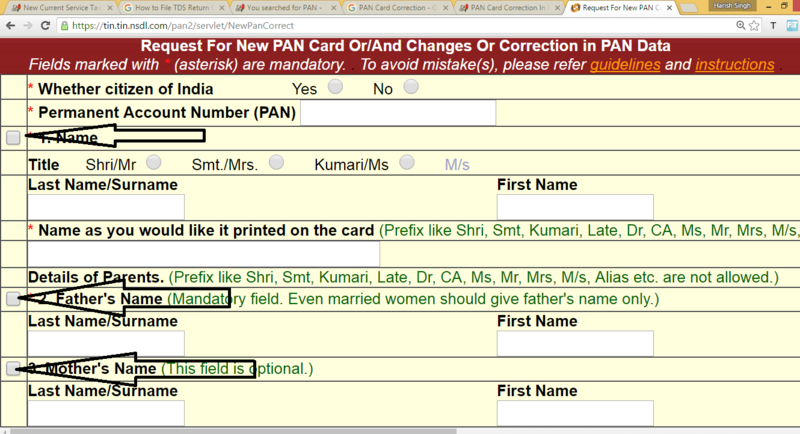 How to make correction in PAN card online ? 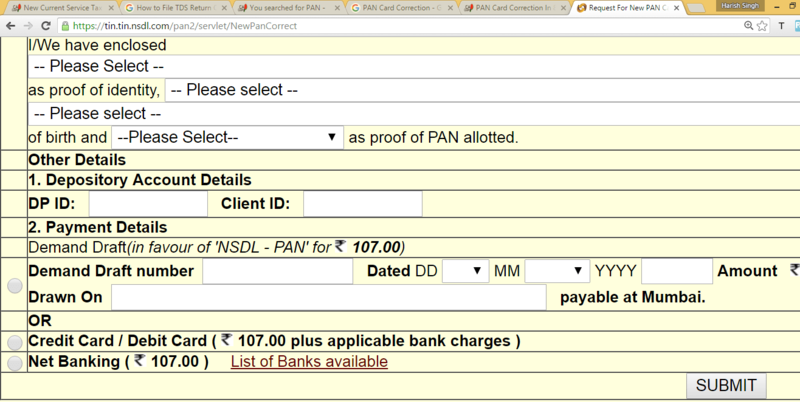 How to download PAN card correction form ? 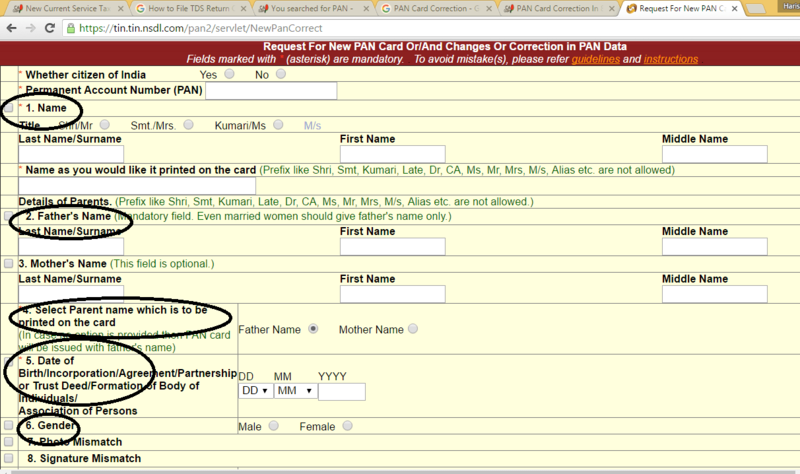 how to make Online name correction in PAN card ? how can I get PAN card Change Form etc. What are the steps for online PAN card correction ? STEP 2 : Select your status . Like Individual or firm or company etc. STEP 3: Only tick the field you want to change in PAN card. Like if want to change you name in the PAN card, and then tick Box next to it. STEP 4: Fill all other mandatory field like date of birth, Gender, Address of communication, PAN etc. STEP 5: Pay the required fees of Rs. 106 by various available mode like debit card, internet banking etc. STEP 6 : Submit the application and print the acknowledgement. STEP 7: Paste recent color photo and sign within box. Hope the process is very much clear now. If still, you have any doubts related to online PAN card correction, please ask through comments. Is it mandatory to post the acknowledgement back to government or is there any other online method for sending the same? My father got PAN CARD,but My address is Sheeja Nivas ,PAN Card addresse is shajee nivas . it is technical mistake..
Any idea how long it takes to get the new PAN ?? What is the eligible documents to be sent for correction in Name and Fathers Name. I have applied for correction with copy of aadhar card but that was rejected by NSDL. How can I change my pincode in pan acknowledgement. meri muma ka pncrd me unke father ka name galat ho gya surname phle aagya toh use thk krne k liye mujhe phr se pay krna hoga kya.